The first buildings constructed from soil had oval, round, curved forms. In addition, the existing buildings on the site shows us by their formation the archetype of constructions made by soil. The pavilion will refer to this architecture that was first made by hands and it is the hands that gave its shape. The pavilion thus follows the line of a curve, that creates a more flexible and inviting interior space. This choice optimizes the relationship between the architectural models presented, the exhibition space and the library. The library is developed simultaneously with the course of the exhibition. Instead of creating a closed, introverted space, our goal has been to accompany the visitor throughout his course with books. The library follows the curve and ends in bleachers, where everyone can settle down and read the book he has chosen. 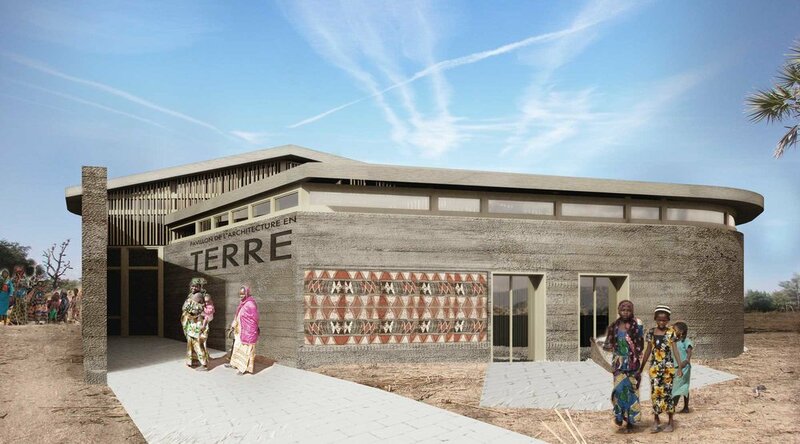 The proposal seeks to promote the construction with soil-rammed earth, by stressing out its cultural, social and economic importance. It also responds to the objective of sustainable development through its contribution to the local dimensions of these issues: the use of local materials and the maintenance of the traditional techniques. The pavilion will be the privileged place for the instauration of a dialogue and it will engage the local community through its paradigm. It will be a tool to empower people to fight against oppression and poverty and improve their own habitat.